Stephen Sondheim's iconic music Follies has come to rest at the National Theatre in a production, directed by Dominic Cooke, with Imelda Staunton, Janie Dee, Philip Quast and Peter Forbes. The new production is strikingly different to the work's first West End outing, directed by Mike Ockrent in 1987. Having two critics see the show within a week of each other seemed too good an opportunity to miss, so here we have both my and Anthony's reactions to the production. Mine from 8 September (third night of the run) and Anthony's from one of the previews (2 September). This enables us to reflect on the way the production might have changed in the run up to opening night, but also to allow for our differing attitudes to the work itself. Follies is one of those works which is very much embedded in my consciousness, it was a seminal work for us in the 1980s even before the iconic Carnegie Hall performances (the recording is still well worth searching out) and songs from the show found their way into performances by many of the cabaret groups with whom I worked. It is a work about which I find it difficult to take a properly critical stance, review in danger of turning into reminiscence (how Dame Josephine Barstow as Heidi compared to Licia Albanese or Adele Leigh, for instance). So what follows is first Anthony's review (he gives it four stars) and then my own thoughts (I give it five stars). 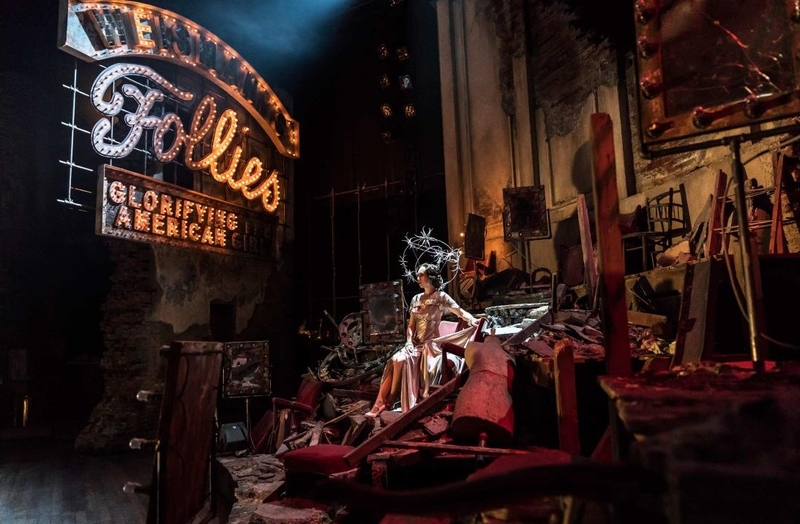 With the first tranche of tickets largely sold out, you can hear the tills ringing at the National Theatre for this hotly anticipated revival of Stephen Sondheim’s Follies. Tickets being as rare as hens’ teeth, I managed to bag a couple for a preview. Inspired by a gathering of the Ziegfeld Follies, here the Weismann Follies come together for a reunion at their soon to be razed Broadway theatre “for a final chance to glamorise the old days”. They sentimentally recreate the performances of the past as the ghosts of their former selves steal around the stage. Sondheim’s affectionate homage to American Musical Theatre pastiches the composers of the 20s and 30s. 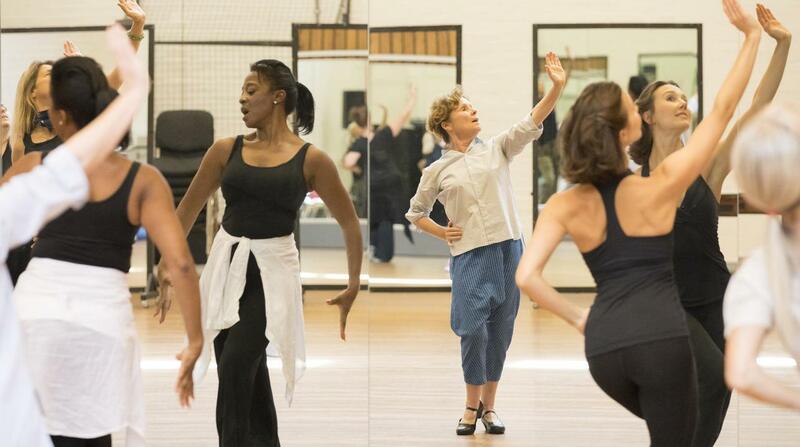 But Follies isn’t just a collection of camp old songs. Like much of Sondheim’s work it’s an unsentimental journey; his precise lyrics and keen observations tell a bitters-weet story not just of the Follies but of the foibles and follies of us all. Past and present collide: youth and age, optimism and cynicism and the characters are forced to confront their tarnished dreams – raging against time. The hulking ruin of a set established the emotional tone of the evening. The lighting gave an impression of dust hanging in the air. “Way up there” a ghostly shadow of lost glamour was revealed and the audience hushed. 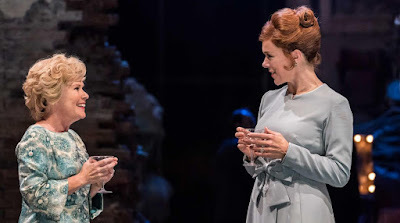 Sally Durant Plummer (Imelda Staunton), a former Weismann girl shiny faced and brittle as glass is the first guest to arrive, her ebullient husband, Buddy (Peter Forbes), is a salesman. 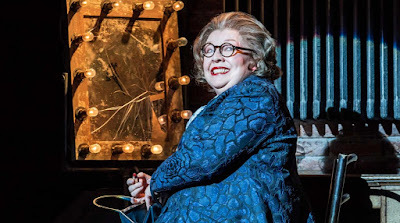 Phyllis Rogers Stone (Janie Dee), an elegant sophisticate, she too a showgirl in the Follies arrives with her husband Ben (Philip Quast), a philanthropist and politician – a snake in a suit. Sally’s deterioration in the hands of Imelda Staunton is a painful thing to witness. She still carries a torch for the self obsessed Ben and from the outset her agitated excitement is a portent of a much deeper malaise. This is a master class in self delusion. Phyllis is as funny as hell, sharp and tough as old boots. It’s a protective carapace that cracks in spectacular style in the searing “Could I Leave You”. Ben has no interest but himself. The charming Buddy is still desperately in love with his wife but how that love is sustained isn’t that clear. They’re all drawn like moths to a flame. The wine flows and the memories tumble after. The naturalist musical dialogue hovering somewhere between recitative and aria is intensely expressive; the discomfort palpable. At the beginning this slough of despond has the tendency to dampen the fuses on the early musical pastiches “Rain on the Roof”, “Ah Paris” and “Broadway Baby” fail to light up. 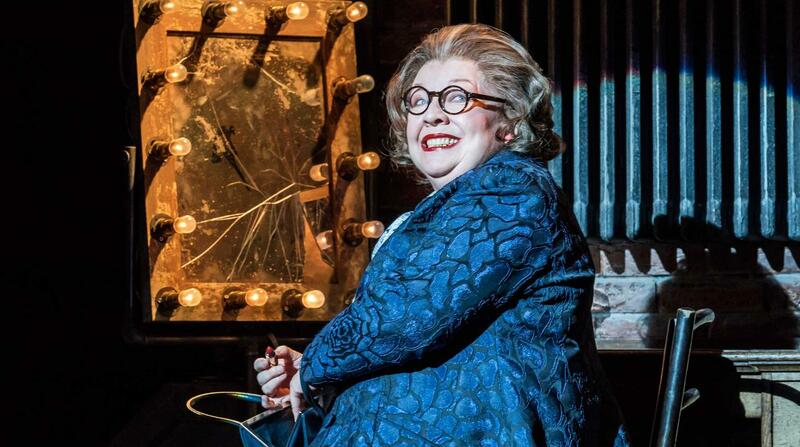 Even Carlotta’s masterly paean to survival “I’m still here” was downbeat. It was in Stella’s storming “Who’s That Woman” that we see some of the glamour they are trying to recapture. No one escapes from the mood of verismo. Even Dimitry Weismann appears as a manipulative womanising showman either unaware or wilfully ignorant of Heidi’s (Josephine Barstow) timid blandishments. “One More Kiss” Heidi’s duet with her younger self was exquisitely poised and achingly poignant. My heart snapped in two. We are exhorted to “never look back” but we’re all prone to a wistfulness, and if I had wished for anything it would be to carry some ray of optimism and hope away with me rather than simply weary resignation. Nevertheless this is an fascinating forensic dissection of responses to ageing and if you’re lucky enough to find an orthodontically challenged hen then grab a ticket while you can. Failing that, it will be broadcast live on November 16. 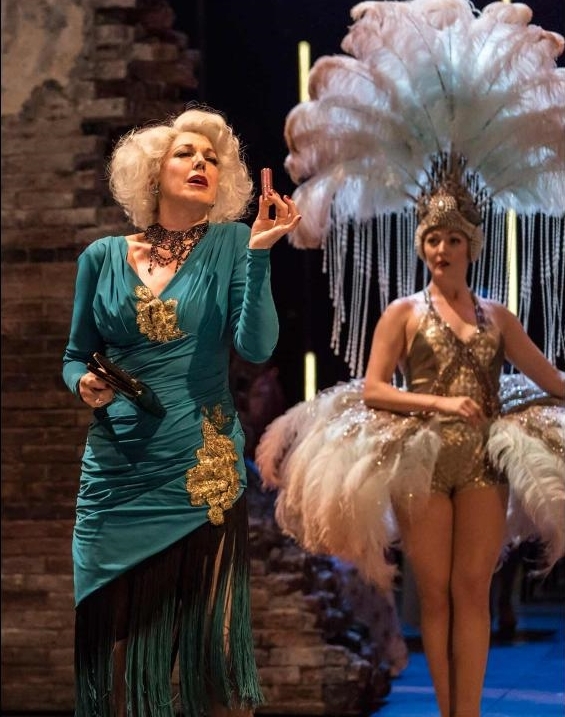 For these performances of Follies, director Dominic Cooke returned to the original version of the show, eschewing the material Sondheim and Goldman wrote for the 1987 West End production (three new songs, including the final song). This returns the show to its more bitter, dystopic view and this, combined with the iconic image of Gloria Swanson (in full glamour mode) in the ruins of the Roxy Theatre in 1960, seems to have inspired the look and feel of the show. Past and present perpetually intertwined, with the ghosts of the showgirls and boys former selves wandering around the ruins, not just the four protagonists had to face up to their former selves. In all the pastiches, the older protagonists always had their younger selves on stage too. So these were more character pieces than full production numbers, and Hattie (Di Botcher) was now a woman with a fuller figure in a trouser suit, recalling her old days in 'Broadway Baby', a deliberately down-beat interpretation which was uplifted by Botcher's voice. Similarly, Carlotta (Tracie Bennett) used 'I'm still here' to show her inner mental struggle rather than being a torch song triumph of survival. Another aspect to the show was emphasised in 'Who's that woman? 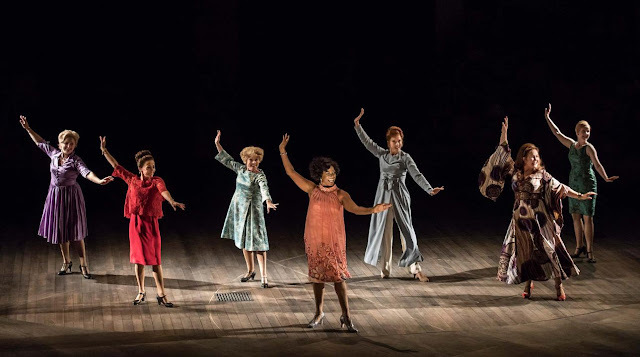 ', the only real full production number, this not only raised the temperature but it was also a celebration of the older actress, as the line-up, led by Dawn Hope's Stella and including Imelda Staunton and Janie Dee, tap danced the way through a big production number. 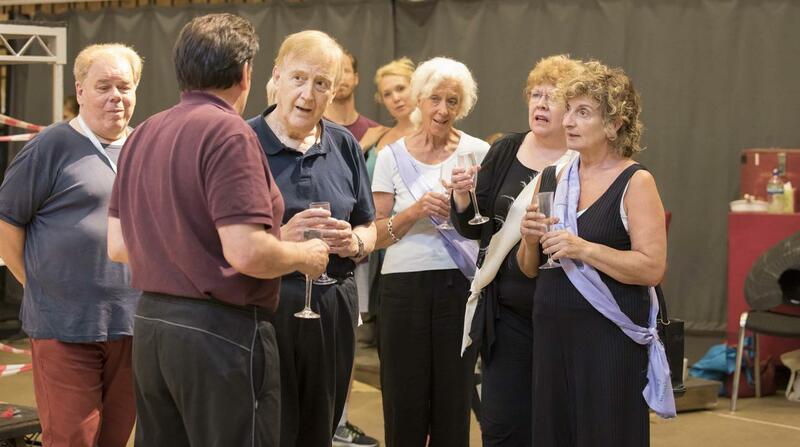 That is part of the joy of the piece, it is about older actors and only works if the players are suitably mature. 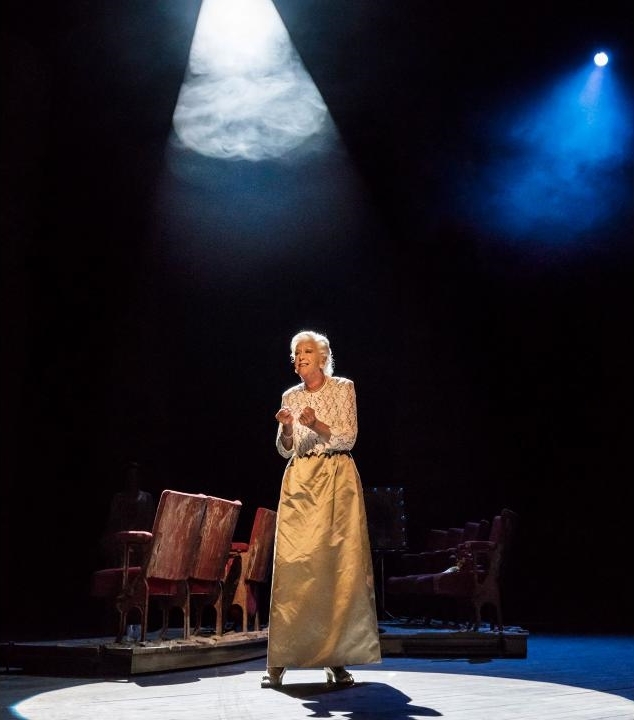 Probably the oldest actor on stage was Dame Josephine Barstow (76 this year, I believe) who turned in a profoundly touching account of 'Just on kiss', with Alison Langer matching her as the younger Heidi. Neither seemed to be miked, or minimally so. 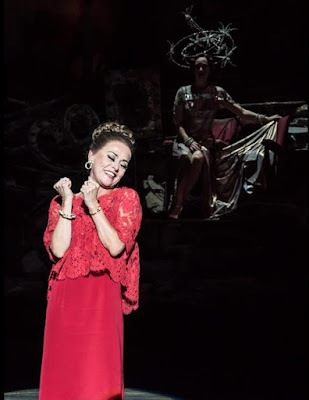 The level of miking was quite high (we had nasty feedback at one point), but it meant that the four leads (Janie Dee, Imelda Staunton, Philip Quast, and Peter Forbes) were able to perform Sondheim's songs with a naturalistic intensity which really brought them home. It helped that all four are fine singing actors. Janie Dee was wonderfully acerbic, and managed the tricky task of being so in her songs as well, and even got laughs without disrupting the emotional temperature. Imelda Staunton was truly riveting as Sally and her account of 'Losing my mind' was profoundly disturbing, much less the comfortable torch song it can sometimes be. Philip Quast and Peter Forbes were brilliant as the troubled bitter men whose lives have not gone well. Forbes was mesmerising in the 'God why don't you love me blues', combining song and dance skill with an underlying desperation, whilst Philip Quast made 'Live laugh love' rather touching when he stumbles, but here the desperation never quite turned to madness the way it sometimes can. The sense of lost illusions and bitter regrets was emphasised by the way past and present played itself out simultaneously (I rather thought of Tom Stoppard's Arcadia), and intertwined so that at one point the older Sally seemed to be imploring the young Ben to kiss her. I found the production thrilling and riveting. I am sure that if I returned, there would be details and cavils, but I will not be returning and am content to mark it down as one of the most thrilling evenings in the theatre for a long time.